Frantic Stamper Precision Die - Fall Words. This set of four dies contains all the essential words you will need. Use them with other "happy" word dies to create your sentiments. We didn't include a "happy" die in this set because there are so many out there that we felt it would be redundant. Thanksgiving die measures 3.5" x 1.25"; Halloween die measures 3" x 1.1"; Autumn die measures 2.625" x 0.95"; and Fall die measures 1.25" x 0.875". Our Frantic Stamper Precision Dies work in most consumer table top die cutting machines such as the Cuttlebug, Big Shot, vagabond, Boss Cut, and Grand Calibur. Some dies may require the use of a metal shim depending on your machine. Joy! Craft Papers - Autumn. This attractive paper set is perfect for Autumn, but can be used for any season. The designs are all plain colours in a range of attractive warm colours. Different shades of oranges, browns, yellows and reds are featured in this set. Includes 12 A4 sheets 2x6 designs double-sided. Weight: 200gr. Size: A4. Craft die featuring the phrase "Autumn Greetings". 100% steel craft die from Memory Box. For use on cardstock, felt, and fabric. Cut, stencil, emboss, create. Use in most leading die cut systems. 2.2 x 0.5 inch autumn, 2.6 x 1 inch greetings. Autumn themed 100% steel craft die from Memory Box featuring a Fall pumpkin. For use on cardstock, felt, and fabric. Cut, stencil, emboss, create. Use in most leading die cut systems. 1 x 1 inches pumpkin, 0.5 x 0.5 inch leaf. Thanksgiving themed Penny Black die featuring pumpkins and leaves. Our sweet and delicate Pumpkin Vine Edger measures 6" long x 0.8" wide. The one piece design is easy to color for added detail. We think you will find yourself using this die for all your fall projects too. Frantic Stamper Precision Dies are made in the USA and will work with most leading table-top consumer die cutting machines. Nothing says fall like a patch of ripe pumpkins. Our pumpkin patch die measures 3.25" x 2.1". 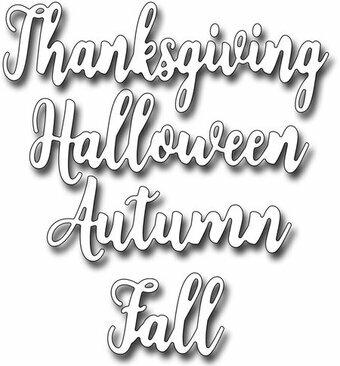 The pumpkins can easily be cut apart from one another to customize the look of your die cut. Frantic Stamper Precision Dies are made in the USA and will work with most leading table-top consumer die cutting machines. 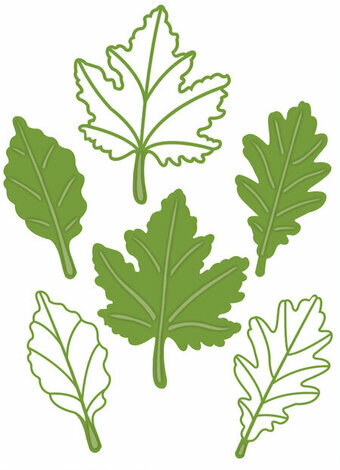 This 5" x 7" Embossing Folder is called In The Forest. Compatible with most leading brand die cutting and embossing machines. Personally designed by Sara Davies, this beautiful Autumn Morning collection is perfect for all your crafting creations. Spellbinders takes adorable to the next level with our new Woodland Collection. 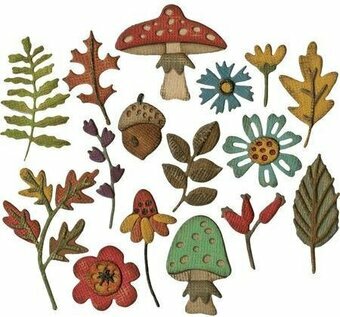 Let your imagination wander through a whimsical world with our new Woodland inspired shapes. Create cute forest acorns that can be used in so many creative ways. Perfect for Cards, Gifts, Parties, Scrapbook Pages, and More! Approximate Size: Acorn 1: 2.35 x 1.30 inches, Acorn 2: 2.20 x 1.20 inches, Leaves: 2.00 x 1.80. 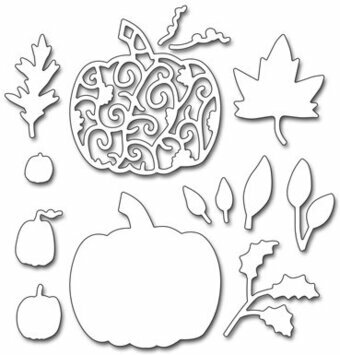 Die D-Lites Fall Leaves Etched Dies is a set of five creates wonderful autumn accents to your fall or Thanksgiving season. Spellbinders Shapeabilities cut, deboss, emboss and stencil with a single etched die template. Approximate Size: Blessed: 2.00 x 1.00 in. 4.90 x 2.00cm, Thankful: 3.70 x 1.20 in. 9.20 x 2.80cm, Leaf 1: 1.20 x 1.50 in. 3.00 x 3.60cm, Leaf 2: 1.0 x 1.50 in. 2.60 x 3.90cm, Leaf 3: 1.80 x 0.90 in. 4.50 x 2.20cm. 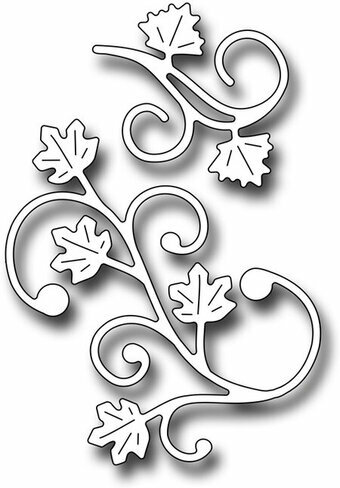 Sue Wilson - Finishing Touches - Autumn Leaf Trio Designed by Sue Wilson these cutting dies are an elegant collection of high quality steel designed to co-ordinate with each other. 6 dies Sizes: Smallest: 1.0" x 2.20" Largest: 2.0"x 2.55"
Marianne Design Craftables Punch Die: Autumn. make 13 perfect embellishments for your cards with this one simple die. Miniature mushrooms, pine cones and pumpkins are included in this piece. Perfect for celebrating the holidays! Size: 1.18 x 3.43 in. 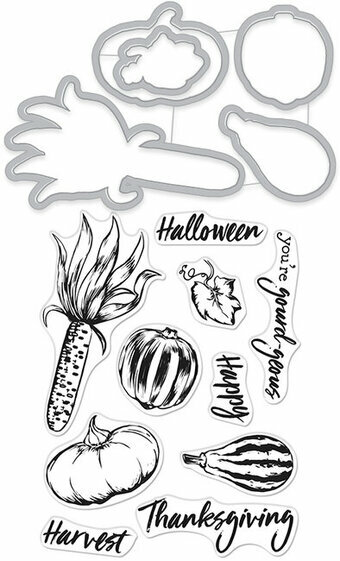 Hero Arts stamps and dies featuring corn, a pumpkin, "Thanksgiving", "Halloween", and more. A set of stylish clear stamps paired with coordinating Frame Dies for use with creative techniques and to add dimension to your cardmaking. Hero Arts 3″x4″ clear is made in the USA from genuine photopolymer, which is non-toxic, biodegradable, and designed specifically to transfer ink to paper for a true impression every time. Hero Arts metal dies are made of solid metal construction with a sharp and durable cutting edge. Universally compatible, they are engineered to easily to align around your stamped images. Frantic Stamper Precision Die - Autumn Scrolls. The set of two Autumn Scrolls will add a touch of delicate detail to your fall cards. The scrolls are adorned with maple leaves and measure 1.2" x 1" and 2" x 1.4". Try them behind the Elegant Thankful word dies (FRA10279) for an added touch of elegance. Our Frantic Stamper Precision Dies work in most consumer table top die cutting machines such as the Cuttlebug, Big Shot, vagabond, Boss Cut, and Grand Calibur. Some dies may require the use of a metal shim depending on your machine. Frantic Stamper Precision Die - Blowing Leaves Square. The Blowing Leaves Square measures 3.5"x3.5". It's the perfect size to use as a focal point on a fall card without a lot of fuss. Add a stamped sentiment and you're done! Our Frantic Stamper Precision Dies work in most consumer table top die cutting machines such as the Cuttlebug, Big Shot, Vaggabond, Boss Cut, and Grand Calibur. Some dies may require the use of a metal shim depending on your machine. Duet Dies - This collection coordinates with our "Fanciful Fall" stamp set. Features an owl, a squirrel, a leaf, and more. Cut the die and then line up the stamp so that there is an even border around the stamped image. Or you can stamp the image first, line up the die around the outline, hold the die into place with removable tape such as washi tape and then run your plates through the die cutting machine. Approximate sizes: A. 3/4" x 1 1/4", B. 1 1/4" x 1", C. 1/2" x 1/2", D. 3/4" x 3/4", E. 1" x 1", F. 2 1/2" x 2", G. 1 1/4" x 3/4", H. 1 1/4" x 1 1/4". Craft die from Yvonne Creations featuring an Autumn Scene Square Frame with trees and a squirrel. This set includes a wheelbarrow as well as a variety of fruits and vegetables. Perfect for Autumn themed projects. Includes 12 dies. Size Largest: 4.92 x 1.97 inches, Smallest: 0.55 x 0.63 inches. 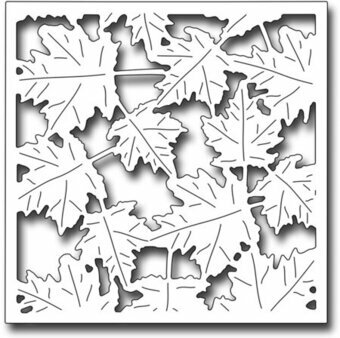 This package contains Funky Foliage: a set of 16 metal dies measuring between .5x.25 inches and 1.375x1.125 inches. Designer: Tim Holtz.